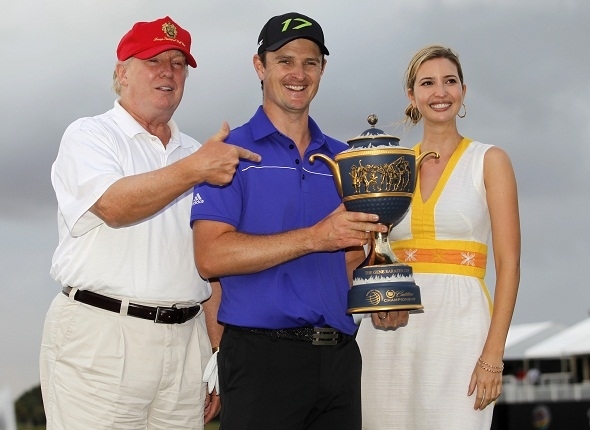 Donald Trump, the tournament sponsor, always presents the trophy, and most likely thinks getting to shake his hand is the ultimate prize. Photo courtesy of sportsworldreport.com. Let’s just start off by saying that these three WGC events are not counted in our year-long draft league, because they are shortened fields and do not have a cut. But I suppose that does not mean we get the week off – we still need to make picks for weekly leagues. After the results at the Honda, trust me, we would like the week off. Though to be fair, every fantasy expert and blog I follow has expressed the same exact sentiments in regard to last week’s picks and results. Anyway, enough dwelling on what was and what should never be. Full field or not, this tournament is one of the most exciting events of the year. Mostly because it by definition puts the best players in the world up against each other, the leaderboard is always strong and entertaining to follow (note: this is also the first we will see from Adam Scott, Henrik Stenson, and a red-hot Branden Grace in the states). And when you head to a course nicknamed “the blue monster,” you know you will get a high level of golf due to a high level of difficulty. Trump National at Doral is a course owned by, you guessed it, Donald Trump. Because of this, you can bet that it is a course in pristine condition, in which – as John Hammond from Jurassic Park would say – they spared no expense in course redesigns and maintenance. You’d be hard-pressed to find a “horse for the course,” because of the significant changes made last year, and the depth of the field yields a very unique leaderboard every year it seems (not to mention several players go in and out of qualification each year). As for the top golfers in the world, really any one of them could win. Whether it be McIlroy, Watson, Day, Rose, Spieth, Kuchar, or defending champion Patrick Reed, you can almost pick names out of a hat from the top 16 in the world to make your picks this week. The only ones that concern us are Stenson and Scott, because they haven’t been playing much, and Kaymer and Fowler because they seem like they still need to wake up and snap into form. We will be hanging our hats on Gallacher’s performance this week. If he does well, we look smart, if not, it could be another week of apologizing for our picks. Photo courtesy of lakegardagolf.com. Jordan Spieth. Of all the “big names” this week, we are not hearing a lot about Spieth. You all know everything you need to know about this guy. Sure, he’s not lights out every week, but who is (see Rory’s missed cut last week)? He’s proven in the Masters, the Hero World Challenge, and other tournaments early in his career that he can rise to the occasion on the biggest stages. If we have a chance to be in the minority by picking Spieth this week, we will take it. Jim Furyk. Another player who isn’t getting a lot of attention, yet it would shock no one if he finished in the top 5. Still, given the other options this week, we consider Furyk to be a definite risk. That is a theme in our PGATour picks this week – we’d like to make up some ground by going for guys that aren’t popular picks this week. Joost Luiten. Another pick that qualifies as a sleeper, but Luiten did finish in a T11 last week and a T13 in this tournament last year. A staple on the European tour, we think Luiten can carryover his momentum from PGA National to Doral. Jason Day. Hard to bet against a healthy Day. Well, when your other options include Rory McIlroy, Bubba Watson, and Adam Scott, it may not be THAT hard… Still, we’ll take Day to keep making a push toward unseating Rory for best player in the world. He has the game, the consistency, and the composure to win here. Matt Kuchar. Only in a WGC, and possibly the majors, will Kuchar drop to the second tier. We will take advantage. He comes as close to the definition of “stalwart” – coincidentally a great GRE word – as any golfer does in terms of fantasy golf. Of course, there were many, many options in the second tier, but it’s impossible to not feel comfortable with Kuch. 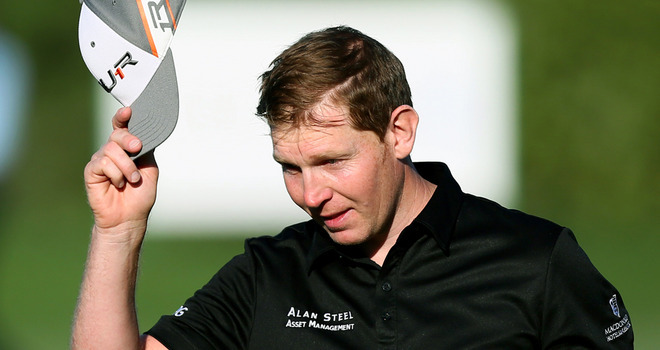 Stephen Gallacher. Again, we passed on many great options because we’re just going for it with Gallacher this week. Please, please, please don’t let us down Stephen! Russell Henley. Because of the field, golfers like Jason Dufner and Webb Simpson fell to the bottom tier this week, which makes the Golf Channel format all the more challenging. We are going with Henley on the hope that he finds the poise that has him ranked 56 in the world, and a two-time winner on the PGA Tour in just his second season as a pro. With Henley, you truly never know what you’re going to get, but if he’s on his game, he can beat anyone in the world. The elements were at full force during the Honda Classic, with so many delays that Harrington could not hoist the trophy until early Monday afternoon. 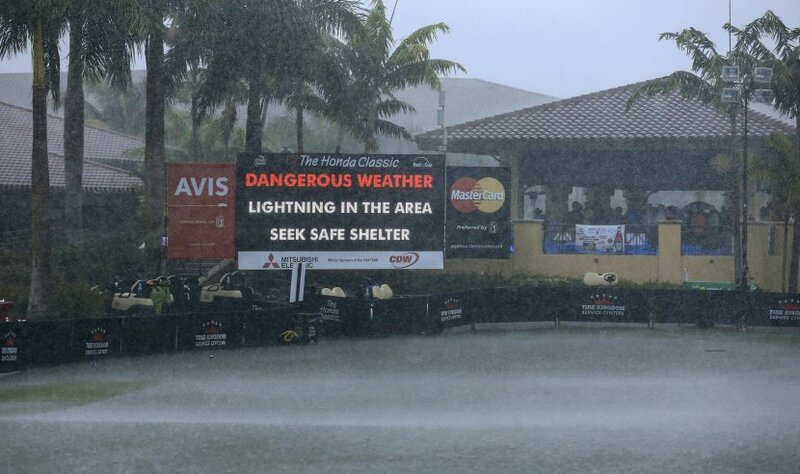 Photo courtesy of PGATour.com. Woof. The Florida swing started off with a punch in the gut-check for the PGA, as well as for our fantasy predictions. Rain, lightning, a lot of wind, and a lot of rain all added up into a Monday finish and 5 brutal days of hang-on-for-dear-life golf that at times made the best golfers in the world look downright silly (see: Poulter, Ian). This resulted in making our picks look downright silly. We knew something had to be going on – we had picked the winner on at least one of our teams in 4 out of the first 6 weeks. Between Hawaii, Arizona, and the California swing, we got accustomed to the relative predictability of the fields, and walked into the Florida swing like big men on campus, feeling like we owned the place. Okay, that may be an exaggeration… we only earned one “A” grade on picks in the first 6 weeks after all, but now we just want to set you up for the sorry grades you are about to see. So here’s what we did know about the Honda Classic: There was the strongest field by far, with 16 of the top 25 golfers teeing it up. There was also a huge showing of elite European players, including Rory McIlroy, Graeme McDowell, and Victor Dubuisson playing their first U.S. tournaments. Sergio was coming off a T4 finish at Riviera, and Justin Rose, Jamie Donaldson, and Ian Poulter were back in the field. It would have been wise to target some European players, because the tournament was ultimately won by Padraig Harrington, and Paul Casey, Ian Poulter, Russell Knox, Jamie Donaldson, and Luke Donald all finished in the top 10. However, Rory McIlroy, Justin Rose, and Graeme McDowell, among other Europeans, failed to make the cut. So even that strategy would have had its pitfalls. As for Americans, much like in the Ryder Cup, Patrick Reed was the only elite player to make a run at it. Mickelson showed some promise before sputtering with a +3 in his final round, finishing in a T17. And finally, I think it is time we mentioned a guy named Daniel Berger. Have you heard of him? Well, if you’ve been paying attention to golf in 2015 you have by now. Berger is a 21 year old rookie from Florida State who has now had the best overall finishes of any rookie in 2015. Though you hear mostly about Justin Thomas, Tony Finau, Carlos Ortiz, and maybe even Nick Taylor, here are Berger’s finishes so far in 2015, starting with the Sony Open: T13, MC, T10, T24, T10, T10, skipped Northern Trust, solo 2 (playoff loss). That is pretty impressive, especially considering all of the talent that did NOT make it into a playoff at the Honda Classic this past week. Berger is definitely a guy to watch out for. There it is. 0 for 4. Is that even possible?? Seriously, this might be a more impressive feat than picking Padraig Harrington to win and Daniel Berger to show would have been. Aside from McIlroy, these picks admittedly were far-fetched, but it is still almost unheard of to not have a single guy make the cut. We apologize to anyone who read and comprehended these picks last week. Russell Knox saved us here. One shining star out of 7 golfers picked. Mark Wilson? WTF?? That pick was like a basketball player taking an ill-advised three. If it goes in you are celebrated, if it doesn’t, you’re benched. Well, we may deserve to ride the bench after this week, but fantasy golf takes no breaks! Let’s see if we can right the ship after such a blunder-filled week.